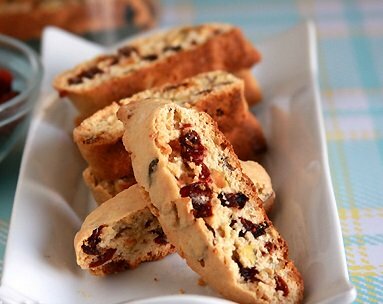 Vegan Orange Biscotti, with cranberries and walnuts. 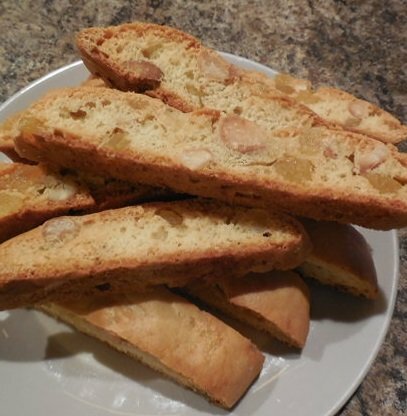 Orange Biscotti is still one of my favorites, loaded with (optional) nuts and dried cranberries, the way I like it! Tip: Last time I baked these I used a technique that if I recall correctly came to me from a Dorie Greenspan recipe to bring out the citrus flavor even more, I rubbed all the zest into the sugar until everything smelled wonderfully of orange. I added this where the original recipe says to add sugar and skipped the step to add zest later. Place one of your oven rack in the middle of your oven and preheat to 325 degrees. In a large mixing bowl, beat margarine and sugar until light and fully incorporated. Beat in eggs and extracts, add the add orange zest. Fold in nuts and cranberries, if so desired. In another bowl, place flours, baking powder and salt, whisk to combine. Stir flour mixture slowly into creamed butter and sugar, being careful to not over mix. Turn dough onto floured surface, kneed briefly until it comes together, wrap in plastic wrap and refrigerate for at least 30 minutes. Divide dough in to two equal parts and shape each into a log 12 inches long. 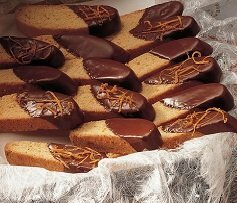 On prepared baking sheet, place each log and press flat until about 2 inches wide and 1/4 inch thick. Place in oven and bake till golden brown, about 25 minutes. Remove from oven and let cool for 20 minutes. Reduce heat to 300 degrees. Place log on cutting board. Using a serrated knife, cut on diagonal, roughly 2/3 inch thick. Return slice to baking pan, laying on one side. Bake for additional 20 minutes, turn over half way through the bake. Remove from oven and cool completely on wire rack. Place in air tight container and store at room temperature for up to two weeks.